Customers of coffee chain Dunkin’ Donuts across the US can now place orders and complete a payment before leaving the house using their mobile phone and a new feature that has been added to Google-owned traffic and navigation app Waze. 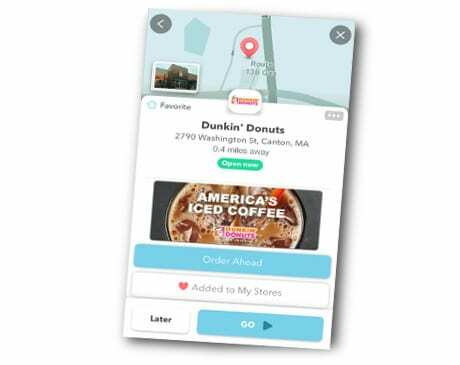 Dunkin’ Donuts is the first brand to make use of Waze’s Order Ahead function, which is set to be rolled out to more Waze brand advertisers in “the near future”. “With the Order Ahead feature, Dunkin’ Donuts and Waze are making the route to Dunkin’ faster and easier than ever for DD Perks members, creating a seamless experience allowing users, before beginning their trip, to use Waze to pinpoint the nearest Dunkin’ Donuts restaurant and tap a single button to launch On-the-Go Ordering within the Dunkin’ mobile app,” the chain says. Waze is a navigation app owned by Google that provides traffic information and other road data to drivers once they have entered in their destination address. It recommends the fastest routes based on real-time driving and data from “millions of users” and alerts drivers to low gas prices and relevant offers from their favourite brands. “Our new Order Ahead feature expands Waze’s mission of saving time on the road by enabling consumers to now also save time in-store, while giving brands a new opportunity to engage with their customers,” adds Jordan Grossman, head of business partnerships in North America at Waze.